Many jobs require shop drawings to be furnished along with the rebar order to assist in placing rebar in the field. PJ's only uses computerized CAD drawings and all in house detailers are linked, allowing consistency and quicker turnaround of your drawings. Shop drawings or "Shops" are also reviewed by the structural engineer to ensure compliance with their drawings. 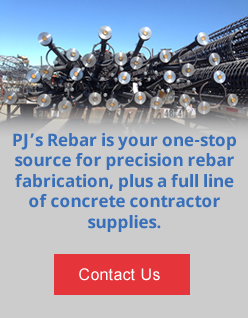 PJ's uses aSa CAD drawings to create shop drawings for review and eventual placing of rebar, they are a vital part of the construction process and often make the installation faster. Contact our Detailing Department to get started. While other fabricators use foreign detailers to reduce costs (outsourced help), PJ's uses only in house detailers and project managers, giving you the control, quality and responsiveness needed to get your job done on time and within your budget.